The newest forklift scale to hit the market answers the industry's call for a pallet-weighing solution that has no extra hardware, communicates wirelessly with dimensioners and other scales via its smart PC, and speeds up the data capture process. See how our new forklift scale can help you cut maintenance costs and reduce accident risk. The less hardware you have to maintain, the lower your risk of failure. The virtual terminal of the TLF820 can't break down and requires no maintenance. The scale itself is low maintenance thanks to patented 3-point suspension that holds calibration for 12 months. Did you know that eleven percent of forklift trucks will be involved in accident this year? Reduce the risk by choosing a scale with no extra terminal to obscure the driver's view and a viewing window that is 16 percent larger than that of any other forklift scale. During the testing of our forklift scales, the forklift was crashed into a wall. The scale still worked (even when the forklift didn’t). Designed for use in harsh, industrial environments, the TLF820 delivers reliable, legal-for-trade weighing results even after knocks and crashes. 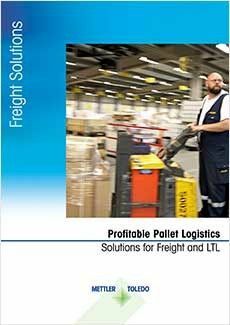 Download our Freight Solutions Guide and learn more about how you can enhance your operations with our dimensioning, weighing and scanning solutions. A pallet loaded with gold and one stacked with feathers require the same transport space but incur very different carrier costs. In our new DWS Buyer's Guide we explain dimensioning, weighing, and scanning solutions (DWS), and how the deployment of an automated DWS solution can quickly yield significant return-on-investment (ROI).